The base of the killer whale´s social structure is the matrilineal unit including adult female and her offspring of different sexes. Some matrilineal units, being in remote relationship and spending together most part of the time, form a pod, consisting from 2 to 40 - 50 animals. Each pod has unique vocal repertoire including either sounds used only by pod members or sounds shared with animals of other pods. Some pods can collaborate with each other for successful hunting or social interactions. All pod members are relatives therefore we can suggest that they mate only during different pod´s associations. Canadian researchers has described uncommon places of Canadian coasts, where killer whales come for scratching themselves by gravel bottom in shallow waters. There one can meet playing or resting whales from different pods. preferring to eat only few, common for an area, most plentiful species of prey. Prey selection determines basic sociobiological features of each population. Long-term investigations of Canadian orca population showed how can differ animals of one species hunting for different prey. Researchers distinguished two sympatric (living at one area, but not mixing) populations: "resident" and "transient". animals in the pod (on average 3). It can be caused by their hunting tactics: transient orcas make an ambush, using bottom relief near seal rookeries. Only one animal snap a seal, othershave to stay on a distance and come to the hunter if seal has already been catched. The most dramatic show is intentional stranding of killer whales for catching pinnipeds on their rookeries at South America coasts. This hunting tradition passes from generation to generation of killer whales, mothers teach their youth to strand on uninhabited beaches on the distance from seal rookeries. If calf can´t return to the water by himself, his mother always helps him, stranding near him and pushing him to the water. 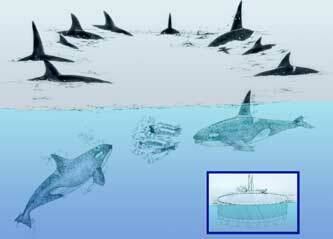 Transient killer whale catch small dolphins alone or surround their group, hunting together with another pods. When attacking large whale orcas hunt like wolves pack. Often they try to exhaust one whale from the group or separate a calf. Attacking sperm whale orcas don´t let him dive because they can´t chase him on the large depth. Sometimes killer whales don´t eat the whale: they can choose only tongue, lips and throat area. May be it is caused by high energetic value of this parts of whale´s body. An important distinction of transients from residents is their vocal activity level: transients keep silent, because marine mammals can hear them. That´s why for orientation and prey detection residents use active echolocation (i.e. original production of clicks and listening their sound reflection). Transients just listen to ocean noises passively and are guided by them. Analysis of nuclear and mitochondrial DNA of resident and transient killer whales showed that there is no interbreeding between them. It is possible that differences in social and sexual behaviour of killer whales specialized on different prey can create strong barrier preventing cross pairing. Analogues of Canadian transient and resident orcas were found at Antarctic waters by Russian scientists A.A. Berzin and V.L. Vladimirov (1982). They have found "yellow" and "white" killer whale forms. These color differences were caused by different amount of algae biofouling, which can paint animals in yellow or fawn tint. These animals could be close to each other, but scientists didn´t observe any mixed groups. "Yellow" animals prefer to keep near ice zone in groups of 150 - 200 animals, and "whites" were at ice-free zone and their groups didn´t exceed of 15 animals. Studying of stomachs content showed that in stomachs of "yellow" orcas 98.5% of food consisted of fish and in stomachs of "white" animals 89.7% of food was marine mammals. Differences between "white" and "yellow" forms were shown in square of pectoral fins, configuration of cranium, etc. Basing on these considerable differences and absence of visible insulating barriers, A.A. Berzin and V.L. Vladimirov concluded that there was genetic isolation. They proposed to distinguish a new species - Orca glacialis, but this initiative was not supported. Currently, researches distinguish three forms of Antarctic killer whales. In general, we know little about killer whales in Russian Far Eastern seas. Most of the studies of these animals have taken place at 1950-1970 years and earlier. While reading these old reports you can find that orca´s groups consisted of 5 - 12 animals, and there were larger groups (30-50 animals per group) in the places of fish accumulation. Y.I. Betesheva and Y.I. Ivanova (1961) studied killer whale´s diet, dissecting stomachs of beached and killed orcas. They have founded that the half of stomachs contained remains of fish and squids and others were empty. Fish diet of Kamchatka killer whales was confirmed by observations of M.M. Sleptsov, describing orca´s hunting for school fish, deep-water perch and squid.